When my husband and I bought our first house we knew there would be work involved, but we were surprised by how much in some respects. The house was in tip-top shape when we walked through it with our realtor (many times), but it was quite different when we moved in, especially the yard and front walkway. The front walkway was one of the things I loved most about our house. It was concrete and brick and was flanked by short hedges of ivy. When we moved in, the ivy was in desperate need of some pruning and then we noticed that the walkway needed some TLC. Weeds and moss were growing between the bricks, there was caked on dirt in certain areas, and the concrete parts were definitely not their natural color. Walkways are sometimes the first introduction your visitors have to your property and they should look great! If you are looking for ways to revive your front walkway, there are two things to help 1) weeding and 2) cleaning. If you are like me and had some gnarly weeds growing in between your bricks or pavers, it’s time to weed. I know, it’s not a fun task, but it is necessary. Spend the time to get rid of the weeds at the root. Yes, at one point I was using a knife to get make sure that I got those stragglers from the base. After weeding, it’s time to clean! This is where I suggest calling a professional pressure washing company like Renew Crew. Depending on the condition and age of your walkway, you could potentially make things worse. 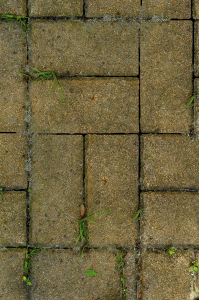 Using a pressure washer incorrectly can very easily crack and gouge your pavers and bricks. Renew Crew uses our three step process to clean, seal and protect your front walkway. Our cleaning will wash away the vast majority of dirt, grim and stains, leaving your walkway looking great for visitors. The protect step is very important if you want to keep your walkway looking great. Most pressure washing companies don’t go to the effort to protect your space, but Renew Crew isn’t most pressure washing companies. Please contact us if you have any questions on revitalizing your outdoor living surfaces. Retaining walls are a great addition to an outdoor living space. They can be used as borders, railings and additional seating if needed. With their various finishes they can also be a decorative detail that brings an entire space together. Just like any other outdoor living structure, however, they need cleaning. Retaining walls are built to withstand the elements, but that doesn’t mean they don’t show their wear over time. If they aren’t sealed properly, the stone or concrete it is made of will start to absorb moisture and dirt as well grow mold and mildew. Recently, our pressure washing company in Austin cleaned and sealed a retaining wall, bringing it back to life. As you can see in the before image to the right, the wall was looking dirty and grimy. Hard water stains were showing down the front creating darker streaks in areas. The tone and color of the wall wasn’t consistent as it had originally been when built. Renew Crew of Austin came out to clean and protect the wall. Our environmentally friendly outdoor cleaner was able to applied to the stone, paying careful attention to the many nooks and crannies that are visible to passersby. After allowing the foam cleaner to dig deep into the surface, the wall was power washed to rid it of all the build up. After allowing the wall the dry, a layer of protectant was applied to keep future stains away. Most pressure washing companies will clean a surface, but don’t follow it up with protection,. That’s the most important part in our mind! If you don’t have a sealant of some kind, you have to go through the cleaning process more often, costing you more money. You can see in the after picture how clean and consistent the stone looks. This is just one of Renew Crew’s protectant finishes. With the retaining wall example, the owner wanted something light in color and natural. Some clients, however want something a little deeper in color. This walkways, as you can see, is darker in color and the color variations of the stone are a little more noticeable. There are a number of different finishes that Renew Crew office apply to driveways, walkways, patios, retaining walls and more. If you have questions on cleaning retaining walls, stone, or pavers in general, please contact your local Renew Crew office. I love the look of a new patio or outdoor project. The edges are crisp, the material is clean and you just want to spend time outside and enjoy it. Over time however, the natural elements take their toll. The stone and brick get dirty and it shows its age. Some homeowners may not realize the transformation that can take place with professional surface cleaning, so when I saw these pictures from our Renew Crew of Johnson County location, I knew I had to share them. Take a look at this brick patio. You can see that dirt has worked its way into the surface, giving the entire surface a dingy look. Instead of the vibrant red that it once was, the color is now a bland reddish grey. Renew Crew was able to clean the brick with a product-specific cleaner followed by pressure washing the patio. Now the color is back to its original state and the dirt has been lifted. Here’s another example, with a concrete and stone patio. As we discussed in a previous post, concrete is incredibly porous when it isn’t properly sealed. In this before picture, you can not only see that it is dirty, but there is also green mold on the surface. It’s normal for an outdoor surface to have mold on it at times and nothing that Renew Crew can’t help. This patio looks so much better after power washing the concrete and stones. All of the colors and texture of the stone can really be appreciated now that filthy film is washed away. And the green mold? Yup, it’s gone. These two jobs are great examples of what thoroughly cleaning outdoor surfaces can do. The before look like spaces that aren’t properly cared for and ones that you may not want to sit and enjoy on a nice day. The after is just like new. It goes to show that just because some looks bad at the time, doesn’t mean it needs to be replaced. There is no harm in having a professional power washing company come out and take a look at your outdoor structures and let you know if they can renew the space. While our clients are thrilled with the cleaning job that we do, we take it one step further and PROTECT the space. If you want to keep your decks, porches, patios and other outdoor surfaces looking great, they need to be properly protected and sealed. Renew Crew’s protective layer stops dirt, dust, water and grime from settling in the materials’ pores. If you have questions on cleaning and protecting patios, please reach out to your local Renew Crew office. A few weeks ago a few friends and I took advantage of a warm spring day and visited a local brewery. This particular brewery opens up its parking lot on nice days and lines it with picnic tables for people to sit and enjoy. It’s a great spot, but I can’t help but think of how dirty the tables and the parking lot are by the end of the weekend (blame it on the job). To keep the place looking nice and professional, they have to invest in commercial pressure washing from time to time. Commercial pressure washing is an important party of property maintenance, especially on properties that service food and drinks. Spills on an outdoor patio are inevitable. While one spill that you pick up right away may not make that much of difference, over time spilled food and drinks combined with normal outdoor dirt and grime will build up, making the space look less than stellar. I wouldn’t want to sit and enjoy lunch on a patio that has caked on food on it, would you? At Renew Crew, we provide commercial pressure washing surfaces that go beyond the normal power washing company’s services. Most power washing companies begin and end with the power washing, we don’t. We not only do our best to remove all the built up food and stains (some stains are too deep to remove), but we also protect the space against moving forward. The process of cleaning and protecting a commercial outdoor surface is slightly different depending on the surface itself, wood, concrete, stone, etc., but in all cases it requires three steps. The first is applying the cleaning formula. For wood surfaces, we use a proprietary foam that digs deep into the surface and loosens the embedded dirt. For concrete surfaces, the cleaning solution isn’t a foam but still digs into the surface. After allowing the outdoor cleaning product to work its magic (and it kind of is like magic, take a look at the video to see for yourself), we use a low pressure setting on our washer to rinse away all of the dirt and grime. Our pressure setting isn’t high enough to gouge the surface which can happen with pressure washers. The last step is protection. Our sealants will seal any open pores on the surface and protect the property’s exterior surfaces from dust, dirt and spills. Commercial pressure washing, depending on the property and its use, needs to be done on a regular basis. In some cases that means multiple times a year. If you have questions regarding cleaning your outdoor surfaces, please contact your local Renew Crew office. Ever since Renew Crew joined the Outdoor Living Brands family I’ve looked at my outdoor surfaces differently. What I never considered dirty (it’s just worn people), I now look at with disgust. The change from new concrete pavers along our walkway to the dingy looking ones I have now was so gradual I didn’t even notice! A lot of homeowners don’t even know that you can clean concrete, but properly cleaning and sealing it will not only keep it looking new, but also protect it from the elements and make your pavers last longer. Using the right concrete cleaner is a key component of restoring your outdoor surface without damaging the plants and ground around it. Most cleaners have bleach that can hurt grass and plants. At our house, our walkway is bordered by low hedges. It would be difficult to clean our pavers without any of the cleaning solution getting on our hedges and I don’t want them to die. At Renew Crew, we have a different method of cleaning and sealing concrete. An environmentally friendly cleaner that won’t harm the surrounding natural elements as it is applied to the concrete surfaces. After allowing the product to loosen the dirt and grime, it is rinsed with a low pressure cleaner. High pressure, that can damage concrete, isn’t needed because of the strength of the cleaning product. After the walkway, driveway or other concrete space is cleaning and dried, a protective sealant is used to stop dirt from penetrating deep into the surface again. If there are some tougher stains, special stain removers can be used in addition to the normal concrete cleaner. Don’t Think you Need to Maintain your Brick Home? Think Again. At Renew Crew, we know the importance of regular maintenance on your outdoor living spaces. No material can sit outside for years without maintenance and look brand new. Last week, the Springfield News-Leader did a story on maintaining your brick home and why it’s important to clean and protect it. My husband and I have been living in our 1950s brick rancher for a few years. When it was being inspected, my husband asked about the cracks in some of the mortar. The home inspector told us that if the cracks are in the mortar, it’s due to the normal expansion and contraction of the home, which is completely normal. He did, however, tell us to make sure to clean and protect it against dirt, elements and vegetation that make settle in the cracks if left alone. 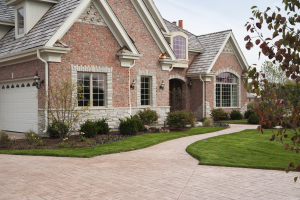 Before a brick or concrete cleaner is added to your home, walkways and driveways, an experienced outdoor surface cleaner will walk the space to see if there are any stains that need special attention. For example, driveways may get some rust or oil stains. Those stains need specific types of removers to loosen and remove the stain. After deeper stains have been handled, a general cleaner is used to clean the rest of the surface. The cleaners works down into the surface removing the dirt and grime that builds up over time. When talking to your outdoor cleaning company, make sure to ask them how the color of the material will be affected. While a strong cleaner is needed to remove the ground-in dirt, it shouldn’t discolor the brick or pavers. Cleaners open up the surface of outdoor materials, priming them for the final step, the protectant. 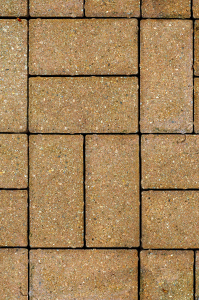 Renew Crew’s water-based protectants are rolled on top of clean brick or pavers to lock out harsh natural elements. There are several finishes that our clients choose from, the natural look, color enhancing, wet (for a glossier finish) and tinted protectants for those that want a different color on their outdoor living spaces. A high-quality protectant will last a few years before needing to be reapplied. If you have questions regarding cleaning and protecting your decks, fences, patios, sidings or gutters, contact your local Renew Crew office.